Hi dear readers! Sorry this post has been a long time in the making, but I had a lot I wanted to share with you all! 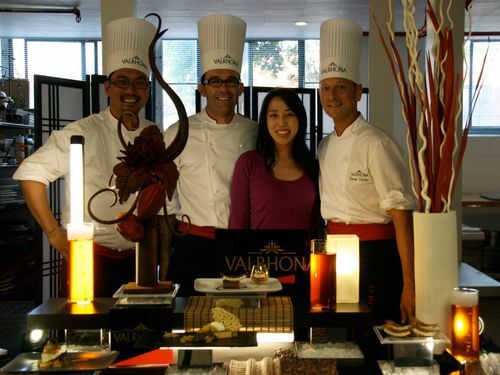 A few weeks ago, I got an invitation to attend a dessert demonstration by Valrhona. 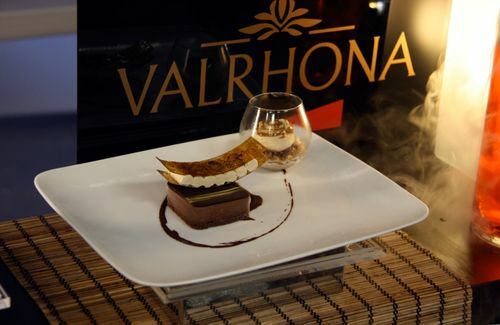 Valrhona is, of course, considered among the creme de la creme of fine chocolate; appending “Valrhona” to the ingredient list of any chocolate dessert is like shorthand for the most luxe and elegant of indulgences. Valrhona chocolate can be pricey, but in their case you truly get what you pay for: beautiful, full-flavored chocolate that tastes dreamy and performs wonderfully. Whenever I get to use Valrhona in my baking, I’m a happy girl. I was especially excited to attend this demonstration because not only was Valrhona unveiling some new products, but they were bringing in some of their in-house pastry chefs to demonstrate how to use them. Another thing that impresses me about Valrhona is their dedication to the industry and art of chocolate: they are involved in both the production and harvest of cacao beans around the world, as well as the creative and thoughtful use of the created chocolate in pastry. Valrhona has a chocolate school, l’École du Grand Chocolat at their headquarters in France, that provides classes in patisserie and confectionery to professionals and enthusiasts. 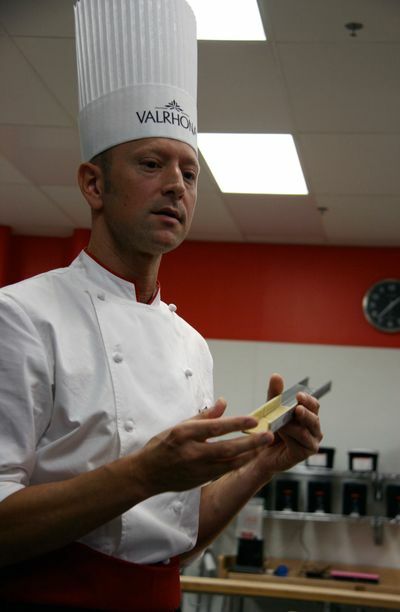 One of the chefs from the school, Philippe Givre, was flown all the way to the Bay Area to lead this demonstration, along with Derek Poirier and Alex Espiritu, pastry chefs for Valrhona’s USA division. Needless to say, what an exciting opportunity! Chef Philippe Givre. Looks like the quintessential French pastry chef, no? Really, the demonstration was more like an intense four-hour pastry class taught by a master – I got a lot more technical information and baking tips than I thought I would from a demo, which was great. Chef Givre went into very detailed explanations of the importance of ingredient temperatures, especially when making ganaches, custards, and mousses; how to whip cream properly to maximize its volume, and even a mini-digression into the the importance of dry to liquid ratios in making ice creams and sorbets. Hey, after this I am fully convinced that going to l’École du Grand Chocolat would be an awesome experience(not that it would take me a lot of convincing to go to chocolate school). In four hours, Chef Givre and his two assisting chefs blitzed through three plated desserts, demonstrating numerous techniques and also explaining how each one utilized different Valrhona products. And yes, we got to sample everything! I think everyone was on a sugar high by the end of the demonstration! Here’s the first dessert: Diagonale of Candied Pineapple with Whipped Lime Ganache, Almond Shortbread, and Fromage Blanc and Lime Sorbet. The idea is really cute: A U-shaped base of shortbread (you can see Chef Poirier making it in the next pic) with piped lines of milk chocolate and lime ganache, topped with candied pineapple and a scoop of sorbet. The ganache is made of cream infused with lime zest, then combined with Valrhona Tainori 64% and Jivara 40%. The mixture is then refrigerated before being whipped to a light, pipable texture – something I haven’t done often, but which I’m now obsessed with! 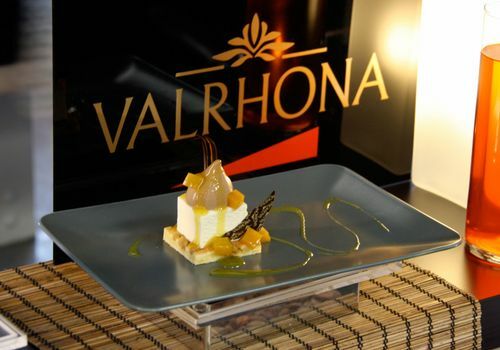 Chef Givre indicated that this recipe was specifically created to utilize the Valrhona Tainori, a dark chocolate with notes of almond and yellow fruits, meant to work best with citrus fruits. Of course it’s a great way for Valrhona to illustrate their long line of chocolates, but I like the point that not all chocolates are the same and it would be a educational experience to taste different chocolates you use and consider which ones might work with different ingredients. Here’s Chef Derek Poirier showing the U-shaped metal molds used to form the shortbread bases. By the way, he was really concerned that I was going to take a photo of him with his eyes closed. So I hope this one is satisfactory to him! Chef Givre plating the dessert. 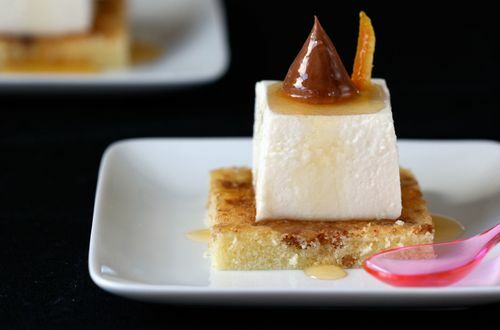 This is the second dessert, called “Damas”, consisting of an emmanuel curry sponge base topped with almond mousseux, a milk chocolate namelaka, and orange jelly. This was probably the most adventurous of the desserts and also the one I liked best, so I spent last week reproducing it! Compare the one I made in the first photo to this one; what do you think? The last dessert was what Chef Givre dubbed “New Opera”, a reimagined version of opera cake. The traditional version of opera cake is layers of almond genoise layered with coffee buttercream and chocolate ganache. In this deconstructed version, a layer of chocolate cake is topped with a square of tempered chocolate. The piece on top is whipped coffee ganache sandwiched between pieces of coffee nougatine. Finally, the cake is served alongside a coffee granité topped with more whipped coffee ganache. I think I counted about four different kinds of chocolate being used in this dessert. 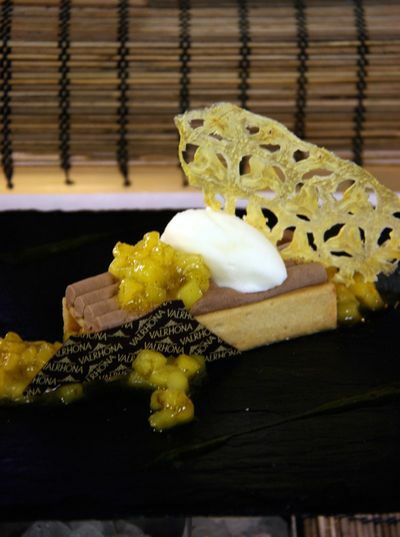 Chef Givre said he wanted to play around with textures while preserving the original flavors of the opera cake. It was a really playful, modern take on an old pastry warhorse; I especially liked the granité with the whipped ganache. 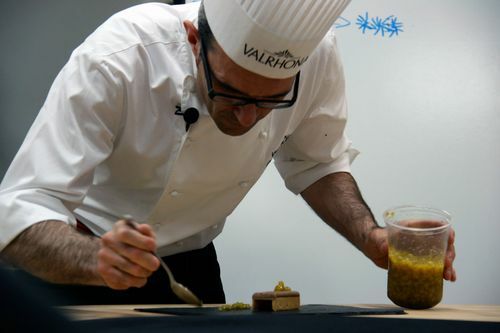 Here’s Chef Givre putting those little millefeuiles of nougatine and ganache together. 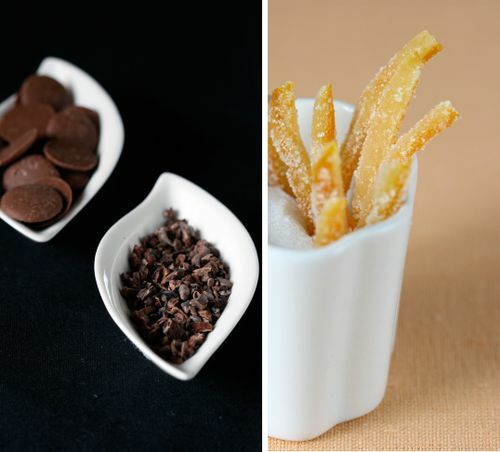 In addition to these three desserts, the chefs also presented a taste testing of chocolate cake and chocolate ice cream made with Valrhona’s newest chocolate, Coeur de Guanaja 80%. Without getting overly technical, this is a dark chocolate specially formulated with lower cocoa butter content, which can allow for a stronger chocolate taste in desserts. Basically, since cocoa butter is a fat and is solid at room temperature, it increases the firmness of pastry items like cakes and ice creams. Since fats can also dilute the purity and intensity of flavors, more cocoa butter can also decrease the strength of chocolate flavor in a dessert. That’s why some recipes using chocolate sometimes call for cocoa powder, since it provides chocolate flavor without adding any fat. Coeur de Guanaja was developed especially to address this issue – it has a lower cocoa butter content, so you can use it and get a strong chocolate flavor in your pastries without compromising the texture of the final result. The taste tests really helped illustrate the difference: a chocolate cake made with Coeur de Guanaja had distinct, chocolately flavor, and was also moister and softer than a cake made with cocoa powder, which was slightly tougher. Chocolate ice cream made with Coeur de Guanaja had a pure, almost bitter chocolate flavor (80% cacao content is pretty dark) and a long, smooth finish, while ice cream made with a regular chocolate had a lighter, sweeter flavor. I found this all very educational. Even if you don’t have the luxury of choosing between ten different chocolates when baking, it’s always good to increase your knowledge of how ingredients, especially one as complex as chocolate, works. Then when you want to tinker with your recipes to get different results, it’s easier to figure out what you want to change. The chefs were kind enough to pose for photos at the end of the demo. From left to right, Chef Alex Espiritu, Chef Philippe Givre, yours truly, and Chef Derek Poirier. Yes, I know I look really short compared to all of them. The tall chef’s hats probably don’t help. Deborah, the public relations contact, was also kind enough to send me a box of samples from Valrhona’s current line after the demonstration. Talk about unexpected Christmas, a big box of Valrhona is enough to turn any day into a celebration! What I love is that Valrhona used to provide chocolate exclusively for professionals, but they’ve really reached out to the consumer market, producing both bars for eating and bars for baking – you don’t need to have a contact in the food industry to procure Valrhona or be forced to buy giant five lb bars (fun, but hard to store at home). They have 70g Grand Crus bars in eight of their signature blends, including their famous Manjari, Caraïbe, and Jivara Lait, 250g baking bars in dark, milk, and white chocolate, and Gourmet Grand Crus bars, their very sophisticated version of candy bars. I’ve been enjoying the Manjari Orange, with pieces of orange inside, and Jivara Pecan, embedded with pecans, for the last week. Ok, so I mentioned that my favorite dessert at the demo was the “Damas” – I really loved the texture contrasts of the sponge cake and the mousseux, and the curry was an inspired touch. Unfortunately, I didn’t have the right spices in my cupboard (Chef Givre suggested using madras curry powder), but I had my own idea on how to spin this recipe. Since the main flavors in the dessert were almond, milk chocolate, curry, and orange, I chose to eliminate the curry from the sponge and add in candied orange peel and cocoa nibs. Emmanuel sponge is a type of sponge cake made very similar to madeleines. You make the batter and let it rest overnight, which helps the flavors intensify and lets it bake up better the next day. Chef Givre indicated that this is a nice alternative to genoise, since genoise batter cannot be stored and can be finicky, requiring closer supervision while baking. Emmanuel sponge batter can be made ahead of time and bakes up quickly without much fuss. I’ll admit the orange-and-cocoa-nib version was amazingly addicitive; I kept snacking on it without the rest of the dessert components! 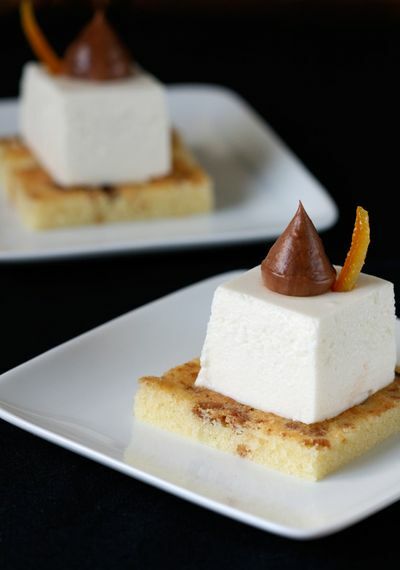 The almond mousseux is a mousse made of almond paste, milk, and cream, mixed with a bit of gelatin and allowed to set. The cut cubes look a bit like tofu, don’t they? And they should have the same perfectly silken texture – it’s important to make sure there are no hard bits of almond paste floating around in the mix. I’d never made a mousse with almond paste, but this was light and airy, and delicious topped with some orange jelly. Finally, you might be wondering what “namelaka” is – I know I hadn’t heard of the word. Namelaka is the Japanese word for “creamy”, and this little daub of chocolate is meant to embody “creamy”. When I saw that it was made of milk chocolate, milk, glucose, cream, and some gelatin, I didn’t see how it was different from a mousse. But the proportions of the ingredients means that the result should be very, very melt-in-your mouth, with no cloying taste. It requires some attention and precision – the mixture needs to absolutely, 100% smooth – Chef Givre used a stick blender to finish the mix off, and you can’t add too much gelatin or it will be stiff and gummy. But I knew it was something good when I gave the boyfriend a spoonful and he remarked on how light and -yes!- creamy it was, before I had described what it was supposed to be. This is definitely a small project of a dessert, but it’s actually not that difficult to make, and it’s become one of my favorites because of its elegance and flavor combinations. I’m really glad to have gotten a master lesson in chocolate and recharged my creative juices- and I hope it’s inspired you to experiment with your favorite brands! Sift the cake flour, powdered sugar, baking powder, and salt into a bowl. Combine the eggs and trimoline in a stand mixer and beat with paddle attachment until combined. Add in the milk and m ix until combined. Add in the melted butter and mix until combined. Preheat oven to 400 degrees F. Line a half sheet pan with a silicone baking mat. Pour the batter into the pan and spread it out evenly. Sprinkle the orange peel and cocoa nibs over the batter (I’m afraid I didn’t keep accurate measure of how much I used – just enough so that the cake is pretty evenly covered, but you don’t need to blanket the batter, or else there’ll be too much add-ins and not enough cake! Just think of adding nuts to a cake batter – similar idea). Sprinkle the baked streusel over the top of the cake. Bake in the oven for 8-10 minutes, rotating halfway. The top should be firm and lightly golden brown. Remove from oven and let cool on a wire rack before cutting. This is a fairly sturdy cake and should not fall apart or stick, but if you’re going to store it, it might be easier to cut into smaller pieces and store them in an airtight container layered between parchment paper. Combine all ingredients except butter in a food processor until finely ground and combined. Add butter and process just until the streusel starts to come together into lumps. If the mixture seems very soft, refrigerate for about an hour to firm up. Spread streusel evenly over the sheet. Bake for about 6-8 minutes, until it is golden brown and baked all the way through. Crumble into smaller pieces as necessary for sprinkling. This is basically a frozen mousse. It helps if you have a cake pan with a removable bottom – then it’s easy to push the mousseux out from the bottom and cut into pieces. Otherwise, the mousseux will be frozen into the pan and you’ll have to cut it out piece by piece. Process almond paste in a food processor until it is soft and pliable. Add in milk and process until combined and smooth (You may have to do this in batches if your food processor is small). Alternatively, combine in a large bowl with a hand blender. Combine gelatin with just enough water in a cup to let it bloom. Heat about 1 cup of the almond milk in a saucepan over medium heat. Add in the gelatin and swirl pan until it is fully melted and incorporated. Pour heated milk back into main milk mixture and mix to combine. Let mixture cool to about room temperature. While you are waiting, whip the whipping cream in a mixer to soft peaks. Fold the whipped cream into the almond milk. Pour the mixture into an 8″x8″ pan with removable bottom and freeze overnight. Note: After it sets, you can store it in the freezer. This recipe uses Valrhona Orizaba Lacteé 40%, but you can use another milk chocolate if you like. Also, one important tip is that in order for the whole mixture to set up properly, you should pour out in a thin even layer, so a wide shallow pan works better than a tall narrow container (if it’s too deep the center won’t set). I used a 9 x 13 pan and it worked well. Melt chocolate in a double boiler or in a metal bowl placed over a pan of simmering water. Add corn syrup to melted chocolate and stir to combine. Heat milk in a saucepan to boiling. Add in the gelatin and swirl pan until it is fully melted and incorporated. Pour the milk mixture over the melted chocolate in increments, stirring to combine and emulsify each time. It’s important to combine the two mixtures slowly and make sure they are fully incorporated or the texture won’t be right. Add in the whipping cream in two additions, stirring slowly with a rubber spatula to fully combine. Process the mixture with a hand blender to ensure smoothness. Pour mixture into a shallow pan and refrigerate overnight to let set. Take out the mousseux and namelaka. If they have been sitting in the refrigerator a while, they may need a little time to warm up and soften. However, don’t leave them out too long or they’ll melt. Cut the sponge into 2 1/2″ square pieces. Cut the mousseux into roughly 1 1/2″ square pieces. Place one cube of mousseux on top of each sponge. Scoop the namelaka into a piping bag fitted with a round tip. If it seems firm, or chunky in the texture, place in a food processor and process to soften up. Pipe a big drop of namelaka on top of the mousseux. great post. 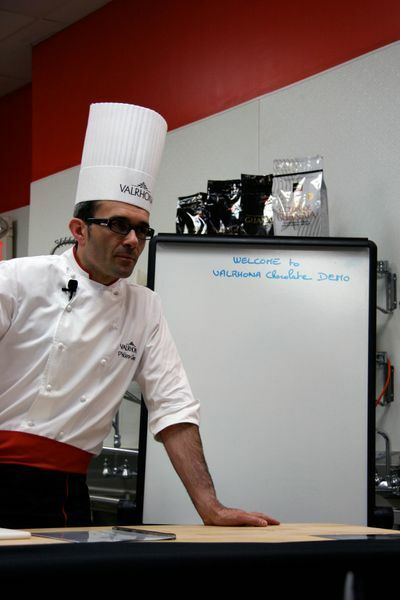 i love the valrhona demos, they’re great for little bits of technical info. would you mind posting the ingredient quantities in grams as well? come to think of it…would you mind emailing me the recipes from the other desserts as well? It’s funny how I’m eating a chocolate with sea salt ganache while reading this. The demo sounds interesting and educational … how I wish I could attend it. Your version of Damas looks as spectacular as the one made during the demo. Wow-I am thoroughly impressed and JEALOUS!! Sounds like you had an ultimate chocolate experience-the sights, smells, and sounds of a true bakers paradise–thanks for sharing-can’t wait for the recipe to try it out and attempt to wow my friends!! PS-Love your book-I am still awaiting a purchase of it but it is on my top three “to buys”!! I love Valrhona chocolate, amazing flavors. I wish I had been there too, it sounds like a great experience. Anita, you’re so lucky that you got to attend this workshop. All the desserts look too beautiful to eat! Great post. 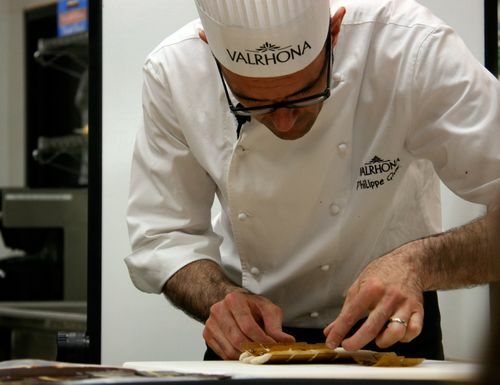 Last year I attended the World Pastry Forum and Chef Derek Poirier taught a class using Valrhona. He is such a good teacher and very personable. Unfortunately he will not be at the WPF this year, but I understand they are making the rounds with their classes. You were so fortunate to be able to attend and thanks for sharing. Your creation looks absolutely beautiful. I think you did a great job re-creating the dessert. Keep up the awesome work! Valrhona chocolate has such intense amazing flavor, I love it. What a treat that you were able to attend a great class, the desserts look wonderful! Beautiful photos. this looks fabulous – what a treat that you got to attend!! i heart all their products! your blog is so cool – thanks for sharing all the wonderful recipes with us!!! AND samples! Lucky lucky you! 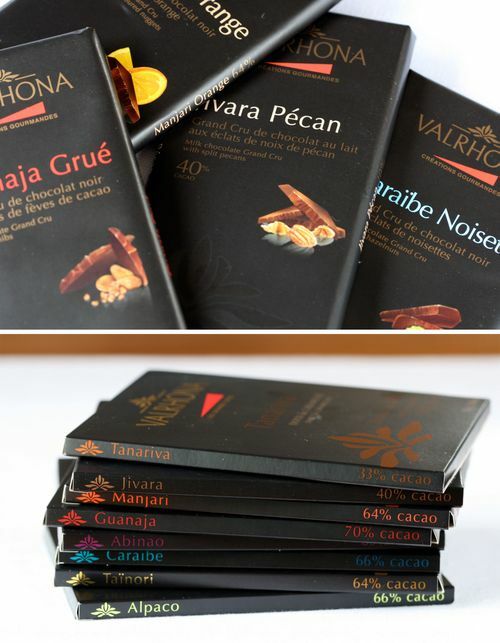 I love Valrhona! Thanks so much for sharing that recipe. All I can say is “wow!” A “wow” experience, “wow” imagination, “wow” photographs, “wow” recreating your experience in such detail for us to enjoy too…fantastic. Thank you! Delicious! Beautiful photographs Thank you for sharing your recipe. That looks sensational! So pretty. haven taste of their 80% choc yet. i love the modern opera!! hey you can try using some of felchin’s products like frambonosia and they have the new nougat flavored paste too.. will taste great with yr sponge! thanks for the emmanuel recipe! hope can try it out at work. I am so envious! I would have loved that chocolate demo. Oh I do mix jivara and tainori when I make an extra rich shot of hot chocolate ;). Perfect combination. All of a sudden, the chocolate I’m eating right now does not seem at all satisfying! Everything looks so good!! Wow, I just love this! I’m hosting a dinner party on Saturday and I was still looking for a dessert. This is it!! Just one question: what’s the service temperature? I mean, do you eat the “mousse” frozen? Do you need to thaw it after cutting it in cubes? I would love to attend this class. It looks fantastic. Thanks for sharing. Do they do house calls? I just had a brief Derek Poirier experience at the Sofitel LA. I said to his colleague that I thought the Macarons were better than Fauchon, and then to realize that I might have offended somebody there (not sure). Do they do the pâtisserie classes here regularly? Thank you for your recipes! I was going to try Valrhona Orizaba Lacteé Namelaka, but it appeared it does not say what you need to do with cream: just pour it into chocolate- milk mixture or whip first and then add into the mixture. Would be very grateful for your help. I’m sorry I missed the step for the whipping cream. You fold it into the mixture without whipping it up first. I’ve corrected the recipe, thanks for letting me know!